Japan's Kohta Araki will likely steal the show at the inaugural edition of the Mongolian International Steppe Marathon this weekend in the hilly outskirts of capital city Ulanbaataar. The winner of Echigo Country Trail last June won himself a free entry for the new race set up by a Japanese company in this for many people still vast and mysterious country. When thinking of trail running and Mongolia, only the long-time classic Mongolia Sunrise to Sunset in the very remote Northwestern Hovsgol National Park comes to mind. But that is about to change with this new event of 50 km that is meant to launch a new tradition. The naming in English may be a bit confusing still - is it Mongolia International Steppe Marathon or Bogd Khan Ultra Trail, and how does that rhyme with the applied abbreviation MSUT - but the 50k race course is crystal clear and in the hands of none other than Carole Fuchs, the French winner of Cordillera Mountain Ultra in Philippines and recent conquerer of Mount Everest. 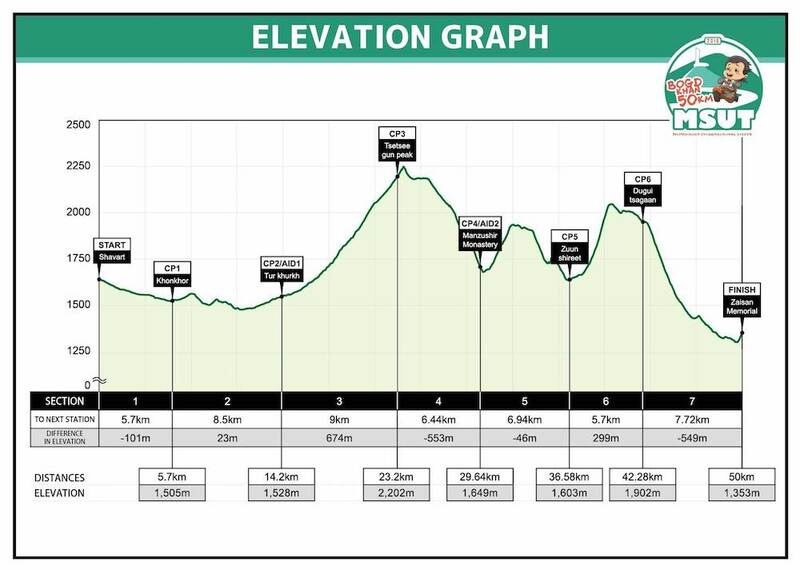 It is a hilly course run at quite high altitude between 1350m and 2200m above sea level. A bit of background. Bogd Khan was born in Tibet and was the third most important man in the hierarchy of Tibetan Buddhism after the Dalai Lama and Panchen Lama. Nevertheless, he moved and lived most of his life in Mongolia. In 1911 he was enthroned as the Khagan - Head of State - of Outer Mongolia after it declared its independence following the collapse of the Qing Dynasty in what is now known as China. The Bogd Khaganate - the reign - was short-lived as in 1919 Chinese troops returned to Urga, as the capital city was then called. In the political turmoil that ensued, Bogd Khan was again reinstated to the throne for three more years till his death in 1924. Then, the People's Republic of Mongolia was officially announced, backed by Soviet Communists. The winter palace of Bogd Khan has been well-preserved an is now tourist attraction in Ulanbaataar. Fascinating stories and cultural relics are omnipresent in this region of the world, and for sure adds meaning to the new trail event in August. While Araki starts the new race as a clear favourite, everybody is hoping to see some Mongolian talents emerge this weekend. Mongolia has a strong tradition in other endurance sports such as cycling, but also its ultra road runners have been doing quite well in international competitions. Trail, however, is largely new to them. This is a 2019 Asia Trail Master Candidate Race, and news will become available this weekend via the facebook page of the event. Bogd Khan Ultra Trail a 2019 Candidate Race! We are happy to welcome the 1st edition of Bogd Khan Ultra Trail aka Mongolian International Steppe Marathon on 19 August as a 2019 ATM Candidate Race. A 50k hilly grassland trail in the mountainous outskirts of capital city Ulanbaataar. With outdoor and endurance sport expert Carole Fuchs as race director and a Japanese production, the event has high ambitions to become a summer classic on the Asia trail scene. The longest distance this year is 50 km. More details via the facebook page of the event. Last chance to register for Mongolia Sunrise to Sunset! Mongolia Sunrise to Sunset is a genuine classic on the Asian and Asia Trail Master calendar. The event will soon take pace already for the 19th year in succession! There's very few, if any, trail ultras in Asia that can claim such a long history. Moreover, this is a race in a very distinct and remote area: the wide grasslands on the plains of northwestern Mongolia. The untouched nature of Northern Mongolia is the setting for the 19th Mongolia Sunrise to Sunset (MS2S) 42km and 100km trail run from July 29th to August 5th 2017. Registrations are open until end of June! Sign up on www.ms2s.org to experience the unique nomadic culture and run in one of the world’s most remote mountain areas. Mongolia (5 June 2017) – Adventure seeking runners can still sign up for the ultimate Mongolia experience: The registration period for the 19th edition of the Mongolia Sunrise to Sunset (MS2S) closes on June 30th. The MS2S 42km and 100km ultra marathon will take place from July 29th to August 5th, 2017. The race location in Hovsgol National Park is stunningly beautiful: With the crystal-clear Lake Hovsgol, remote, marshy forests, windblown lowlands and craggy mountains, the MS2S is without a doubt one of the most beautiful runs on the planet. The Mongolia Sunrise to Sunset is more than a marathon and ultra-marathon race: Participants from all over the world spend one week in the wild nature. They get in touch with the nomadic culture of the locals and learn about Mongolian traditions, beliefs, and way of life. On their quest to complete this spectacular race, runners pass by wild horses and yaks, seas of wildflowers, the craggy mountains and windblown lowlands. MS2S opens new perspectives. All proceeds of the event are used to keep Hovsgol National Park pristine and clean as well as to support the culture of the local nomads via the “ecoLeap foundation”. “We want to keep this pristine mountain area as beautiful as it is now. That is why we fund a litter control project and its ongoing operation including hiring park rangers, providing eco-friendly garbage bags and raising awareness nation-wide through TV ads and education of local children and families”, explains race director Nicolas Musy. The race is not only beautiful but also challenging: The accumulated elevation gain/loss in the marathon distance is more than 2.200 meters, in the 100km ultra run it is more than 3.300 meters. Still, everybody with a strong spirit and good training can complete the race. The cut-off time is 18 hours. The 19th Mongolia Sunrise to Sunset (MS2S) 42km and 100km trail run and holiday takes part from 29 July to 5 August 2017 in the untouched nature of Northern Mongolia. Experience the unique nomadic culture and run in one of the world’s most pristine mountain areas. MS2S is one of the oldest and classic trail races in Asia, and for the third consecutive year, runners can score points there for the Asia Trail Master Championship and, if they do the 100k, for their individual Grandmaster Quest. The Mighty Lake Hovsgol and the untouched forests, lowlands and mountains of Hovsgol National Park are the setting for one of the most beautiful runs on the planet: Mongolia Sunrise to Sunset (MS2S). It is more than a marathon and ultra-marathon race: Participants from all over the world spend one week in the untouched nature. They get in touch with the nomadic culture of the locals and learn about Mongolian traditions, beliefs, and way of life. All proceeds of the event are used to keep Hovsgol National Park pristine and clean as well as to support the culture of the local nomads via the “ecoLeap foundation”. “We want to keep this pristine mountain area as beautiful as it is now. That is why we fund a litter control project and its ongoing operation including hiring park rangers, providing eco-friendly garbage bags and raising awareness nation-wide through TV ads and education of local children and families”, explains race director Nicolas Musy. The MS2S is a unique opportunity for runners from all around the globe to discover spectacular views of the beautiful Mongolian landscapes from start to finish – be it on the lakeside single trail when the sun rises behind Lake Hovsgol, on the impressive mountain passes or in the marshy, remote forests. On their quest to complete this spectacular race, runners pass by wild horses and yaks, seas of wildflowers, the craggy mountains and windblown lowlands. MS2S opens up new perspectives. Reduced travel package prices are available until end of March. Register now on www.ms2s.org! Concise information is also available via our cover page. At 4 a.m., sunrise in northwestern Mongolia, the 18th edition of Sunrise to Sunset has started in the Hovsgol National Park. This is one of the pioneering 100km trail races in Asia, which is even more remarkable when considering the very remote location. Runners who take part in the event require a mini holiday as getting there and away takes time. That is also why the race can be held on a Wednesday instead of on a weekend day. The participants are as always a very international mix combined with some of Mongolia's own top endurance athletes. The entire event goes to the benefit of the Hovsgol National Park, and the local communities in the vast area. We will update on the race proceedings as soon as we get news. For the second year in a row, adventure-minded trail runners who make the effort to go to a very remote part of the world will be rewarded with Asia Trail Master points for the 2016 Ranking, and for the Grandmaster Quest. Mongolia Sunrise 2 Sunset is one of Asia's oldest trail races and all to the benefit of the Hovsgol National Park and the local Mongolian communities. The event comes with a travel package from the country's capital Ulaanbaatar and the actual race is scheduled for 3 August. Please acquaint yourself with the event via the below press release from the Organising Committee , and key race details can also be consulted via our event cover page. In the first week of August 2016, adventure seeking runners from all over the world will take part in the 18th Mongolia Sunrise to Sunset (MS2S) at the shores of Lake Hovsgol. The registration period for this unique adventure 42km and 100km trail run, taking place on 3 August 2016, is open on www.ms2s.org! Runners from 22 countries participated in the 2015 race, creating an exceptional experience. How deep blue can a lake be? And how many different shades of green do exist? Up to 100 runners from all over the world will find out in August 2016, when they gather at Lake Hovsgol in the wilderness of Northern Mongolia. Their quest: The 18th Mongolia Sunrise to Sunset (MS2S). The MS2S, a non-profit 42km and 100km ultra trail run, is without a doubt among the most beautiful runs of the world. Runners pass by wild horses and yaks, seas of wildflowers, the craggy mountains, windblown lowlands and of course the deep blue pearl of Mongolia, Lake Hovsgol. Early bird rates – The special offer is quit finished ! Runners with an appetite for a special adventure can now secure early bird rates for the race package online on www.ms2s.org. “This is not a one-day event. We offer a whole week full of discovery and adventure”, explains Musy. Participants gather in a picturesque camp at the lakeshore, sleep in traditional Mongolian yurts and get in touch with local nomads and their culture. In the days before and following the race, runners can enjoy a variety of leisure activities: horseback riding, fishing, kayaking, hiking, or mountain biking. The 2016 race week will take place from July 30th to August 6th 2016. To beneficiate of the special offer, register before march ! In the 2015 race, runners from all over the world participated in the MS2S. Altogether, the organizers welcomed participants from no less than 22 countries. The young Mongolian runner Tumenbayar Shagdar was able to secure the win on 100km in a time of 11:54 hours. French Aurélia Veyre was the fastest ultra-lady in 15:16 hours. The 42km winners were the Mongolian Tugldur Tselmegsaikhan and the Canadian runner Jennifer Pasiciel. In the veteran 100km category, Swiss Marc Progin won in strong 15:36 hours.